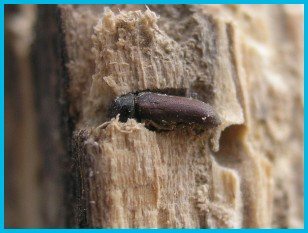 Woodworm is a term used to describe the infestation of a wooden item or timber by the wood-eating larvae of a number of different beetle species. The grubs do not come from a specific species of beetle, however, the effect on the timber is the same. 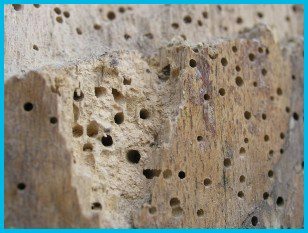 Woodworm can cause serious structural concern if present in a property so once identified it is critical to remove and prevent the issue as soon as possible to reduce the costs associated with treating a larger outbreak in the future. Woodworm is often easy to spot as the infestation results in holes within the affected item or timber. The holes may vary in size but are typically 1mm to 1.5mm in diameter for most common household beetle species. During the summer months, it may also be possible to spot the adult beetles which have emerged from the wood. The beetles lay their eggs on or just under the surface of the wood and the larvae feed on the wood itself causing structural and cosmetic damage. These larvae then turn into beetles themselves and repeat the cycle, causing further damage. 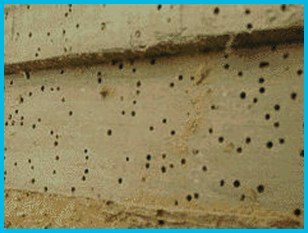 Because the larvae need moisture to live successfully, woodworm is more common in properties where there is a problem with excess damp, perhaps from poor ventilation or condensation build up. Some woodworm is only found where fungal rot has already started to occur so they may be an indication of more severe damp problems within your property. Woodworm is nearly always controlled using chemical insecticides. 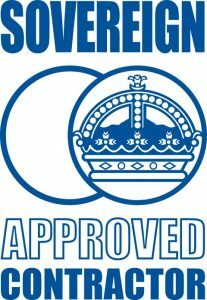 It is also advisable to investigate and remove any potential damp issues in the vicinity of the woodworm problem since dry wood is rarely affected by woodworm and wood that remains damp may result in further woodworm or rot problems in the future. To ensure appropriate treatment and prevention of future woodworm outbreaks in your property, Davidson’s DPR will undertake a full survey of your property before recommending the appropriate course of action to remedy and address the problem and the cause of your outbreak.